Ofcom’s release of broadband performance figures this morning was pretty useless if you wanted to know where to get value for money. After spending the morning messing around with a spreadsheet (caveat: I don’t quite trust OpenOffice yet), the service you want is Virgin Media’s “up to” 30Mbps service. At its worst, between 8pm and 10pm on week-nights, it still provides 100% of what you pay for. As you can see from the graph, the service you want to avoid is KCom’s Karoo, but KCom recently said it is upgrading its network, so users in the Hull enclave can look forward to an improved service. Ofcom said, “The average advertised speed in May 2011 was 15Mbps, 8.2Mbps higher than average actual speeds of 6.8Mbps. In November/December 2010 the gap was 7.6Mbps (when the average actual speed was 6.2Mbps and average advertised speed was 13.8Mbps). Given that ISPs except Virgin Media deliver a level of service that is below what they advertise, I asked the ISPs’ association what they had to say for themselves. ISPA also said that subscribers should pick an ISPA member when choosing a supplier because the supplier would have to abide by the ISPA code of practice. Since BT is a leading ISP, its view of the code is important, especially in rural areas where it may be subscribers’ only choice of ISP. Which suggests that the code of practice does not outlaw ISPs continuing to advertise headline “up to” speeds, knowing full well that they cannot deliver them. Earlier in the year, the Advertising Standards Authority asked its code-writing bodies to look into this issue and whether broadband advertising was misleading the public. It said in a statement Ofcom’s latest findings would be part of its investigation, which would be “concluded as soon as possible”. The news is not all bad. Ofcom found that average speeds were up fractionally from 6.3Mbps to 6.8Mbps since November 2010. 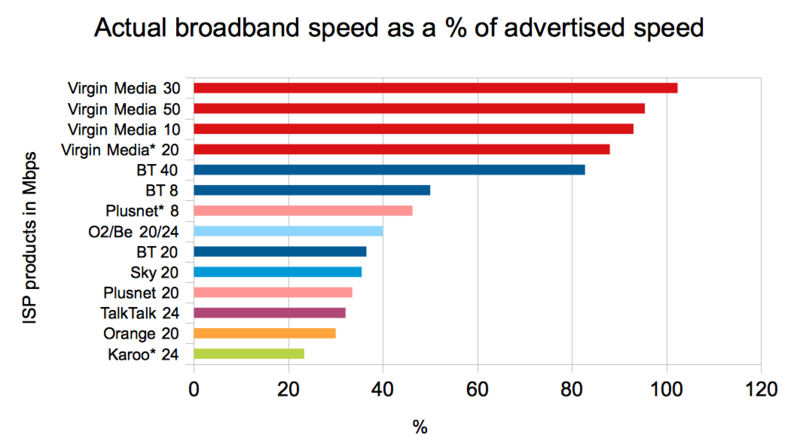 Almost half (47%) of UK residential broadband users are on packages with advertised speeds above 10Mbps in May 2011, compared to 42% in November 2010 and just 8% in April 2009. This shift no doubt made it easier for BT to accept Ofcom’s decision to cut the price of its “up to” 8Mbps service by the retail price index minus 12% a year – more people are paying more for faster packages, but clearly not getting what they pay for. It is regrettable that Ofcom does not provide a geographic breakdown of its results. Its new interactive map provides some information, but not enough for consumers to make a decision on which supplier and service to choose, where there is a choice. when FTTC is the norm and ADSL is a minority then the speed differential will still be the same..
Then it will be back to fresh handouts to the incumbent to upgrade it all again to FTTP..